There are a lot of steps getting pots ready for the kiln. The first step is of course getting the pots thrown and completely bone dry. That can take as little as a week or as long as 3 weeks depending on the clay thickness, and drying area. The warmer the area the pots are stored in the shorter the time it takes to get to the bone dry state. Before the glazing process the pots must be bisque fired. 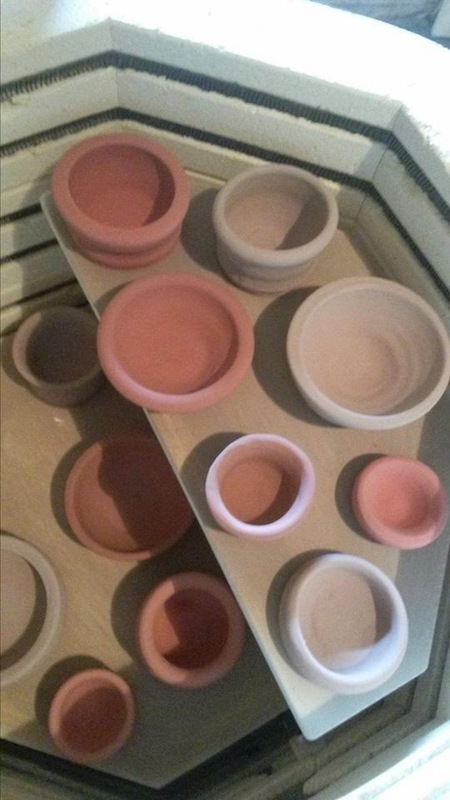 Bisque firing takes the pots from green-ware stage to bisque. This is where the pot is ready to accept the glaze. 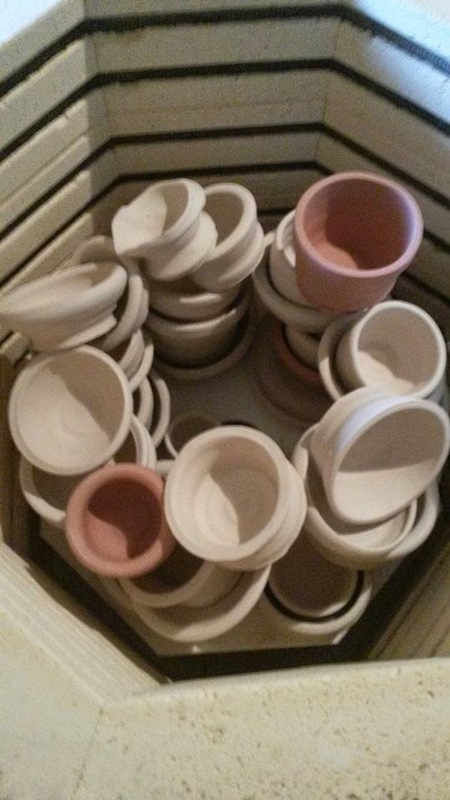 The kiln can be fully loaded, meaning pots on top of pots and the kiln sitter loaded with the correct cone for the type of clay. After the firing is complete the pots will have a slight ting sound with thumped. On to the glaze. Glazing a pot is a step where a mixture is applied to the pots that when fired actually turns to a liquid glass and coats the pots with a protection and decorative layer. For our test fire, we picked up an assortment of glazes from Clay-King out of South Carolina. This is the same place I purchased my ClayBoss pottery wheel. They have really reasonable prices. We used the dip method to coat the pots. Because I'm still learning how to throw, I neglected to make sure all my pots had a lip or foot on the bottom to hold on to while dipping. This made for a bit of extra clean up before we could put them in the kiln. The bottom of the pots all need to be completely free of the glaze to ensure that the pots don't stick to the kiln shelves during firing. 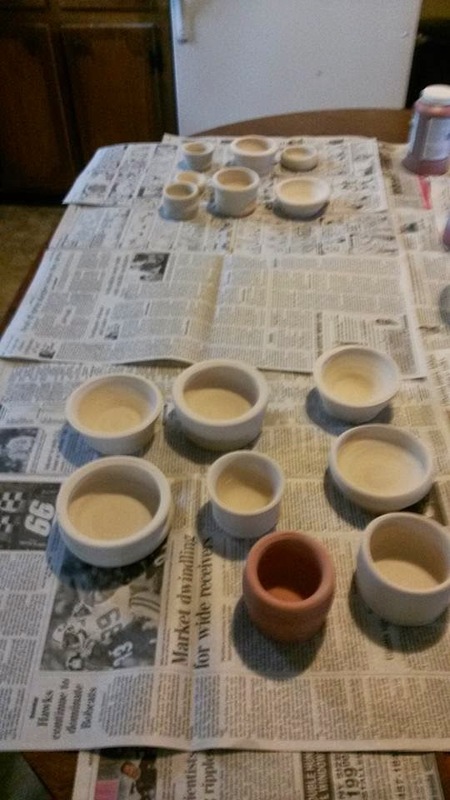 After the pots are dry from the glaze they can be placed in the kiln about an inch or so apart. The pots should not touch. They should be away from the walls, the top and from each other. As the kiln reaches the firing point and the glaze turns to liquid glass, the pots can become fused together or to parts of the kiln. Each kiln is different and requires a bit of testing to make sure everything fires nicely. We have a kiln sitter on our kiln. The sitter holds a bar (pyrometric cone) that breaks when the kiln has reached the correct cone or temperature. When the bar breaks the kiln shuts off. The kiln then cools down over the next day, at which point the pots will cool down and be ready to remove. Sometimes an event will occur. It is called under-fire. This can happen if power goes out or if the kiln does not reach the correct temperature to melt the glaze. If this happens, it is usually a good idea to do a cone test on the kiln to ensure that the kiln is reaching the correct temperature to melt the glaze. You'll be able to confirm a miss-fire by opening the kiln and seeing the following image. It will look EXACTLY like it did when it was loaded. Sometimes, some of the glaze may appear melted however the photo below shows no changes to the glaze coat. That is what happened to us on our first fire. So for now, we test fire, fire again and hope for the best. Next week, tune in for what we hope will be a colorful reveal.